This little sludge blanket detector makes it really easy and cost effective to monitor sludge blanket levels in lots of variations of settlement tanks. You don’t need any extra carry bags with this clever water instrument as it has a cable reel design making it compact and easy to carry around. The 715 detects sludge blankets by winding the sensor down into the tank. Once the sensor reaches the blanket, the audible tone will change and the LED will illuminate – it couldn’t be easier! This method has been deemed far more effective than other SludgeJudge style systems that can see the need to handle meters of tubing filled with contaminated wastewater. Here at Partech we know how important it is to have reliable detection in order to de-sludge tanks at the right time. It can be extremely inefficient if the tank is emptied too frequently as a domino effect occurs relating to other parts of the operation. Additionally, if the tank isn’t emptied enough it can then begin to cause problems with other stages of the process or even cause issues in the local watercourse. The 715 sludge blanket detector uses a series of infrared sensors which helps to detect the sludge present in the interface zone which is usually considerably thinner than the sludge present at the bottom of the settlement. 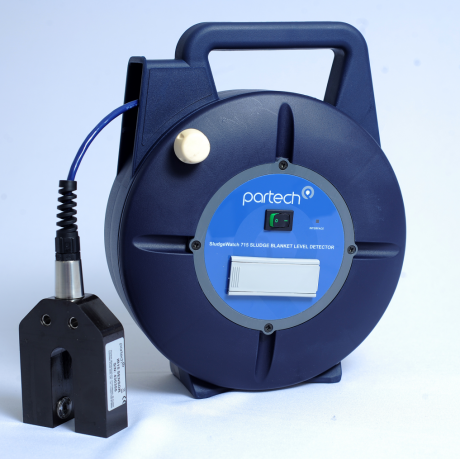 To take a look at the Partech 715 sludge blanket detector, click here.